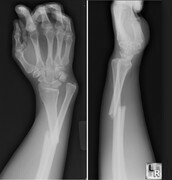 A fracture is a broken bone. If you suspect something is broken you should tell your parents.Usually the limb or joint is deformed. When you see something is fractured don't touch gentle pressure or movement causes pain. Another way you know something is fractured is by looking at your in most cases the bone pierces the skin. Also if you see someone who has fractured something and is unresponsive begin CPR if there is no heartbeat. The main steps are to first, stop any bleeding. You should apply little pressure with a clean cloth. Next, you should stop moving the injured area. If you see a bone sticking out don't try to push it back into place. Furthermore, you should get a ice pack to help the pain. You should also know not to place the ice pack directly on the bone you should wrap it In a towel. After you've done all of that you should then treat the person for shock.